So not to boast or anything, but last night Matt and I *may* have hit upon the perfect combination of Dainty dishes. 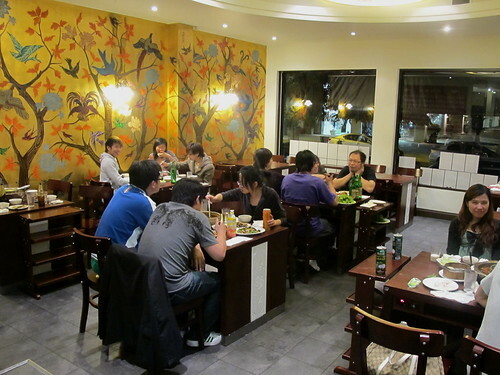 Dainty Sichuan, home to the best authentic Sichuan food in Melbourne, moved from its former scuzzy Chinatown laneway location to posh South Yarra in 2009. 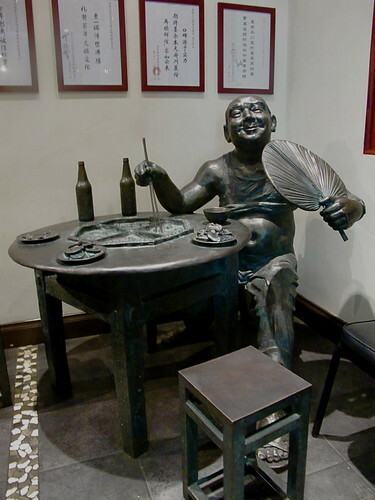 Its current digs have fancy pictures on the walls and bigger rooms, but the atmosphere remains chaotic and bustling with students grouped around hotpots. I introduced Matt and S to Dainty a few months and they've gone back repeatedly. We decided late in the afternoon yesterday to catch up for a spontaneous dinner, and Matt and S brought along their friend J. Our mission: to order the perfect combination of Dainty dishes. Four dishes is the perfect amount for four people. No entrees or extras, other than steamed rice and a few Tsingtaos which we sent Matt to get from the fetch-it-yourself fridge by the stairs. We tried the cumin lamb slices ($24.80) on Matt's first Dainty visit, and he and S have ordered them on each of their subsequent visits. 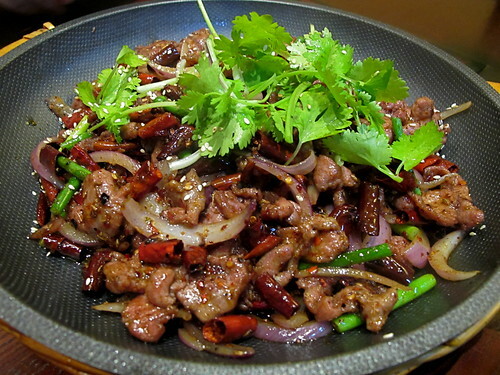 The heat in the dish is a triple threat (chilli, sichuan pepper and cumin) blended together masterfully. The cumin is brilliant. Don't be scared off by the fact that it has a 3 chilli rating (the maximum) in the menu - we reckon it's more like a 2 chilli dish. The Kong Pao prawns ($25.80, 2 chilli rating) were juicy and sticky and sweet and sour, everything a good Kong Pao/Gong Bao dish should be. Because I am wussier than Matt and S, I left some of my chillies on my plate. 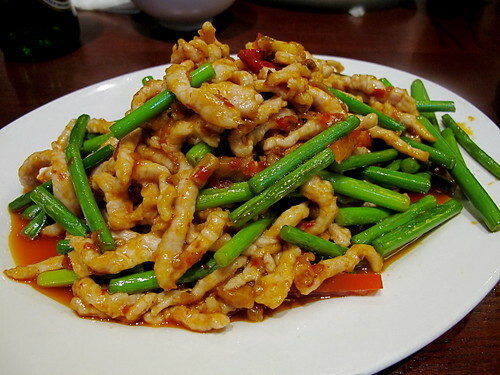 For the first time we ordered the pork threads with garlic shoots ($20.80) and were well pleased with the result. Described in the menu as "Sichuan home style", the dish was spiked with lots of ginger and slightly milder Sichuan pepper (though it still had a 2 chilli rating). And last but certainly not least, the legendary fish flavoured eggplant. New York culinary enfant terrible David Chang (who recently announced the planned expansion of his empire to Sydney, thus ensuring renewed #momofukurage in Melbourne) declared Dainty's eggplant to be the best thing he's eaten in Australia, enthusing to Gourmet Traveller: "They fry it, I think they roll it in sugar and fry it again, and then they toss it in chilli madness." This would have to be one of my top 10 favourite dishes in Melbourne. The 2-chilli-rating chilli is pickled, and the use of sugar and corn flour help give the eggplant the most sensational sticky texture: lightly crisp on the outside and meltingly soft on the inside. $17.80 for a small mountain of the stuff, and worth every last cent. The bill came to just over $40 each and we floated down the stairs in a happy post-Dainty haze. MUST RETURN SOON. Great tip about the eggplant - sounds divine! Just as we have the 'classics' of beef & black bean, lemon chicken etc, Kung Pao is part of the pantheon of American-Chinese dishes. Others include Mu Shu (which was sort of like Peking duck, but with different meats) and crab rangoon, which are wontons stuffed with cream cheese and imitation crab. It's good to see it in its original form, just as sweet & sour pork does have an original Cantonese form. Ah, yes I used to have a friend who loved this place... and the eggplant is definitely something special. I think they still have a shoot-off store in China town...? I keep meaning to drop by this place, but it keeps not wanting to find me time to go! Now I really want eggplant! Eggplant and Kong Pao a must in any 'best of Dainty' list for sure, I reckon Ma Po Tofu has to be up there to. Haven't that pork dish yet, so have to put that next in the list to try. Have you been to any of the other restaurants in that building? Flower Harbour looks interesting judging by the description at http://www.truelocal.com.au/business/flower-harbour-chinese-restaurant/south-yarra. 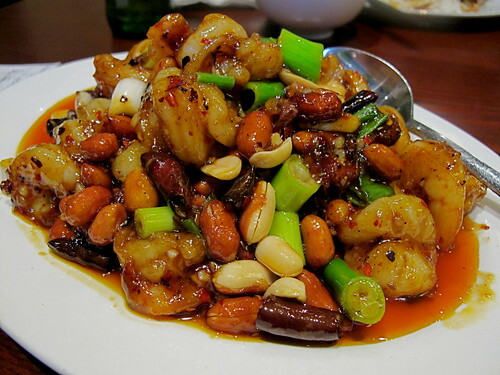 As you know I find irrestible dishes with a menu description such as "Dry-Braised with Fragrant Spicy Ingredient". I have been reading your blog for nearly two years, and love it to bits. But this is the first time I have commented. You see, I have been sitting on a beach in Nicaragua for the last two weeks relaxing and hammocking. Although the food is amazing here, the same conversation with my partner always comes up. "What is the first place we will eat when we get home?" This time, after 5 weeks away in Central America the answer is most definitely Pho Chu The in Richmond and Dainty Sichuan. I can already feel the euphoria spreading over me from the chill induced endorphins. Great Post. Thank you for the amazing photos! Oh that eggplant looks divine. 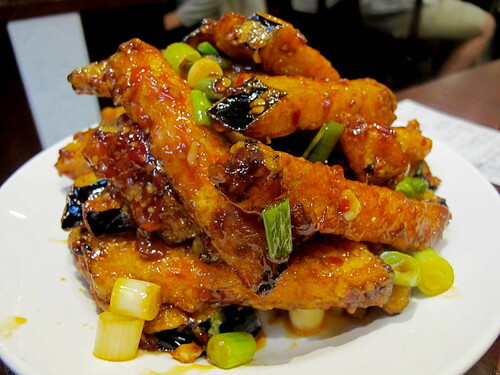 I love a good sichuan eggplant dish. 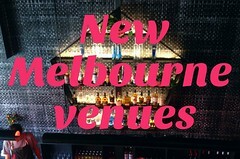 The one at the Malaya in Sydney is the best I have come across so far. 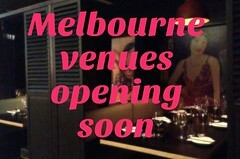 Have been frequenting Dainty for the last few years now finding it’s the only authentic Sichuan in melbs. LOVE IT. Found a treasure on the menu in the last visit. The cold noodle dish, pretty sure it’s in the starters! Worth a try!